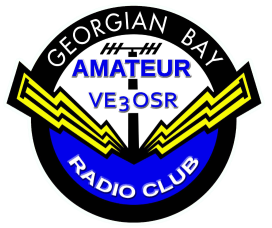 The Georgian Bay Amateur Radio Club operates this website as a free service to all Radio Amateurs and prospective Radio Amateurs and for those interested in related topics. Though we endeavour to ensure the accuracy and family safe content for all ages for all information and links placed on this web site, we do not warrant or guarantee the accuracy or correctness of such information included in but not limited to, projects, articles or of any other content, description or material placed on or referred to on this web site. All content of this website is to be used with a "Let the Buyer Beware" make up your own mind attitude since some of the material is considered experimental and you should consider that the author/s of the content have presented it in, what they believe, to be good faith. We do not warrant that the web site, its content or the server that makes it available are error or virus free or free of other harmful components or that your use of this web site will be uninterrupted. In no event will we be liable for any loss or damage (whether direct or indirect, including loss of profits or any consequential loss) resulting from or in any way connected with your use of this web site, contents or links, information, whether internal or external, whether caused by negligence or otherwise. If your community or charitable event needs reliable radio communications for health and welfare, safety, security or logistics, please contact one of the executive by clicking the "contact GBARC" link on the menu above. Our goal is to improve our knowledge in electromagnetic communication, make our expertise available to our community and to encourage and assist others to enter the world of amateur radio. Our club was founded in November 1973, incorporated in May of 1993 and has operated continuously since. GBARC operates 3 repeaters. VE3OSR in Owen Sound 146.94- T97.4, and VE3OST in Woodford 146.895- T97.4 and VE3GBT in Paisley 146.730- T97.4. All three repeaters are UHF linked. We can also be contacted on Echolink on Node 333014. These are "open" repeaters, free for anyone to use. The repeaters, club events and this website are funded by GBARC membership dues.